Guardian’s policy tester enables you to determine what policy actions would apply for a given URL and, optionally, a specific user or group at a specific location and time. This is done by the policy tester sending an impersonated request for access to a URL. 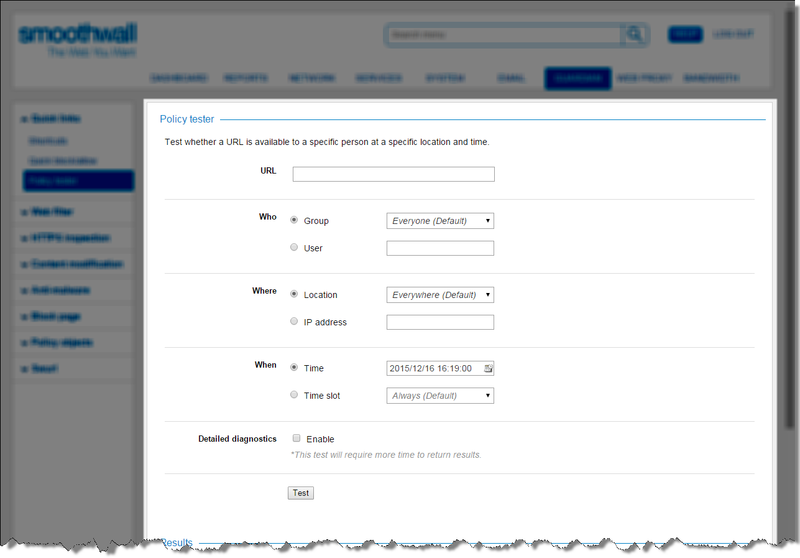 Tip: Use the policy tester to check possible negative side effects of adding a user/group, time slot or location to a Guardian policy. 1. Go to the Guardian > Quick links > Policy tester page. The test is run from a hypothetical, newly created tenant. This should only match those categories that are applicable to all tenants. The test is run as if a user is attempting to browse whilst not assigned to a tenant. The request is blocked. Tenants are only available if you have the correct license type and they have been configured on the System > Administration > Tenants page. For more information about tenants, see About Multi-Tenant Managed Services . • URL — Enter the URL to be requested. If the URL contains www. enter that too. From the drop-down list, select the group(s) who would make the request. Enter the name of the user making the request. From the drop-down list, select the location(s) from which the request would be made. Enter the IP address from which the request would be made. Enter the time at which the content would be requested. Specify the time slot(s) during which the content would be requested. Tip: It is possible to impersonate a request made in the past. For example, you can check if someone could have accessed a URL previously. Note: Hyperlinks to other pages are not tested. 3. Click Test. For each Guardian policy enabled at that time, Guardian displays what action has been applied regarding the URL and the options you specified. When testing a URL which results in a redirect, the URL to which the original is redirected and its status are displayed. This enables you to policy test the redirect URL. For information about URL statuses, see: http://www.w3.org/Protocols/rfc2616/rfc2616-sec6.html#sec6.1.1. Note: The policy tester can impersonate a user or group(s) attempting to access web content. Guardian does not log impersonated requests. However, an upstream proxy may capture and log the request as coming from the user or group(s) being impersonated.  On the Dashboard page. If the Web filter option is enabled on the System > Preferences > User interface page, you can run quick policy tests.  On user portals. If the policy tester has been enabled for a user portal, it will be available when users access the portal. For more information, see Enabling the Policy Tester.